Impeachment inquiry document obtained by Island Waves. 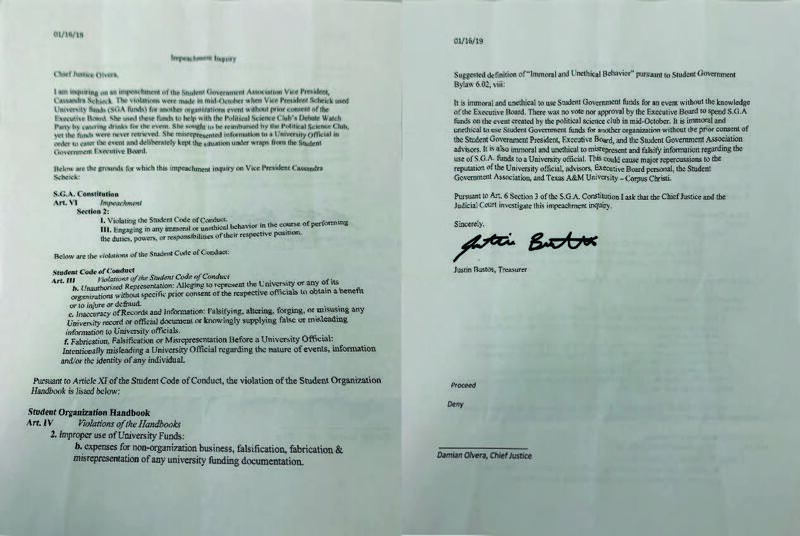 According to documents obtained by Island Waves, an impeachment inquiry was launched against Student Government Vice-President Cassandra Schieck earlier this semester. SGA Senators, who asked to remain anonymous, voiced their frustration over the lack of transparency in proceedings. The faculty advisor ultimately decided that there was no misuse or mishandling of SGA funds. According to emails obtained by Island Waves, Schieck made a catering request for an SGA event on Tuesday, Oct. 16 at 8 p.m. However, according to I-Engage, SGA did not host an event on this day. But, according to TAMU-CC’s Political Science Facebook page, they did have a debate watch party during this exact date and time, listing SGA as one of the sponsors and as the provider for refreshments and T-shirts. The Political Science’s I-Engage page shows meeting minutes taken Oct. 1 with Schieck elected as secretary and Connar Allen, the current SGA president, elected as treasurer. The meeting minutes also noted the need to establish a budget for the watch party. Several SGA members tell Island Waves they were never informed about what ultimately occurred regarding the allegations. Different sources told Island Waves that a special Senate meeting was held earlier this semester where they were told an inquiry was being made, but there was no follow-up as to who was the target of the inquiry or what is was for. Island Waves will have more on its investigation in Issue 7, scheduled to hit stands this Thursday, April 18.